How did you teach your Doberman to not pull on a leash? Any particular methods did you use? At what age did you start to see any improvements? How often do they need reminders? What distractions are the hardest to overcome? How did you teach your Doberman to not pull on a leash? Any particular methods did you use?I taught Lexus I guess by just rewarding her for keeping slack in the leash, and also have used the method where I stop dead if the leash gets tight. What type of collar and leash do you use? (prong, harness, flexi, etc)That depends, usually if my intentions are to be on a loose leash and I know we will be in a public situation at some point while walking when we head out, I will put the prong on her with my 6ft leather working leash. Typically though she just on her flat nylon collar and I have my flexi I walk her with. But if I'm going in the woods to walk I put her harness on with the flexi, which she does tend to go to the end of her leash and feel a tug before she lets up, but she is enjoying the woods and scents too, so I never punish her, we just don't go on (which is what she desperately wants to do!) until she has let up. What distractions are the hardest to overcome?Hmmm, for whatever reason there are certain people we pass in yards that she won't take her eyes off them, she NEVER barks, but she insists on facing them as we pass, so I usually call for her attention and give her a little tug to remind her to catch up with me. And with her mom, oh lord, try to get any attention out of the two of them when they are together! All they do is whine under their breath and get really to launch into play I do like to walk the two of them on a connector, but they are always in a heel, they just need a frequent verbal reminder to relax. Yeah I can see me, I'd be like a kite flying behind them if I let them walk loosely! 150 (ish)lbs of happy dog woohooo! Mush mush!! Sensation Harness, for my Pit Bull too. She improved alot since she had the harness and training. She went to school at 6 months to Head Start Progam at the Humane Society. She does need reminding when she sees people, she loves people. Nylon collar, sensation harness and 3 foot leather leash. All hooked up together. People, kids, other dogs; in that order. I let Malika run off leash at the park, later at night. She is very good about not being further than a few feet from me. From the very beginning he has always wanted to stay right next to me, hasnt really been a problem. He has his moments, but he was really easy. I see improvements in him each time we go out. Since he is a puppy I try not to "remind" him to much, because I dont want him to get burned out. I give him a small margin of error and he pretty much knows his boundries. He will pretty much "foos" or "heel" on command. Nylon flat collar when playing. Pinch/Prong Collar when training. No collar in the house. 6ft Nylon leash. Lets see...when he was about 8-9 weeks old, everytime he heard a dog bark, he would just stop dead in his tracks and look around for a minute. We overcame that and now suddenly he has an issue with cars driving past us, I think it is just that 10-16week fear stage though, I just encourage him to keep moving, some days are better than others but I think he will be fine. Not really, but he is still young. We will see. We're in this process. Bruno LOVES to run free when we take him to an open field. But walking him is a different story. So I'm going to read some of these and soak in the info. Because I want Bruno to walk nicely by my side so I can walk him down town and in places where he won't pull. He does fairly well now. But I want him to ALWAYS stay by my side. Pippin, though not my "first" dog, was my first dog that I actually trained! So he got to put up with my own learning experiences, my mistakes, and my indecisive attitude. He's been on a prong and a martingale once or twice, but I realized I had no idea what I was doing. The training class I took wouldn't allow for anything other than a flat collar or a head halter, so he was on a Halti for quite awhile. I wasn't exactly pleased with it, but it did the job and I had a trainer there helping me along. He did decently on it and it helped lay the "foundation" for actual loose leash walking, but I don't consider head halters a training tool. He now is only ever on a flat buckle collar and I still do training with it. So for now I use the start and stop and random direction change method (as well as positive reinforcement with treats and toys). When he pulls, I stop moving and he's gotta be slack before I continue. If he refuses to let the lead slacken I'll turn around and promptly move the other direction. Depends on what you mean. Like I said, the entire time he was a pup I was learning more than he was. I would say I really saw big improvements when I enrolled him in an actual obedience class. He still needs reminders almost everytime we go out... But I don't use physical corrections. I'll give him a "eeeeey!" "eeeeeeeasy" (in a low, quiet, but not quite growly tone) when I see him starting to ignore me/move ahead. That generally works to get his attention back on me and I'll give him a command (sit, down, etc.) and give him a treat. If he hits the end of the leash I'll stop, or turn around and walk the other direction. I use a four foot leather lead and a flat buckle collar. The hardest distractions are things that are alive... Humans (especially kids)... But other dogs are by far the hardest thing. Generally if I start walking away from another dog he'll start to pay attention. Humans that I don't allow him to greet can get him a bit on edge (not in an aggressive way, but he does go into a more alert mode if I continue to walk by someone who is quite aways away). Other dogs around who's owners aren't paying attention. If another dog is walking on a loose leash and ignoring him (or off doing it's own thing), he may be eager to greet but won't pull me (much, he still does need reminders). If a dog zooms right up to him and sniffs him all over it's MUCH harder for him to pay attention and to walk away calmly. Java was pulling on her lead from day one (close to 4 mos). That is, until I took her to obedience class and the first thing the trainer did was put a training collar on her. It only took two corrections (and an initial indignant yelp) for her to get the idea that maybe she wasn't in charge after all. Even at 10 mos, her posture and attitude change slightly when the collar is on her. I only use it when we are walking, and she is much better about maintaining a loose leash. I rarely need to pop the leash, even during obedience classes (and this is generally during a 'leave it' exercise). It only takes the rare pop on the lead to correct her. Part of this is just maturity. Her attention span is better, she is more focused on the task at hand and eager to please. She has also become my 'velcro dog' - she doesn't want to stray too far when we're together and/or she is on leash. Word of warning, though - don't be surprised if people who see your dog with a training collar on give you wide berth on the sidewalk or even cross the street. They assume the training collar is there to keep a vicious dog in line. I have had this happen on a few occasions - funny thing is, both times Java was walking nicely at my side not even giving the other dog notice. The first time this happened she was 5 mos, ears taped and all oversized paws - hardly a Kujo! If you don't currently have your dog in obedience class, you may want to consider a few private sessions with a trainer. If you can find one who has experience with Dobes, even better. Titles: They can get titles? SRD!!!! * How did you teach your Doberman to not pull on a leash? Any particular methods did you use? When we got Gracie she already knew not to pull. But once we took the prong collar off she was allowed to pull. No discomfort in her normal collar. * At what age did you start to see any improvements? How often do they need reminders? Now I use a choke chain. I almost never have to use it. I only give one or two corrections then she is good. * What distractions are the hardest to overcome? Crowds. We have a hard time keeping her attention in a crowd, so much so that we just wont take her with us if we are going into a crowd. Any advice on any of the above would be appreciated. Come see us at: Gracie's Dogster Page! Come see us at: Cubby's Catster Page! My mind is only 98% here some times! Still a bit of a problem at a year and a half old. We use a "gentle leader" (very similar to a halti) and she will not pull. Flat collar and if she is not in a heel, she'll run as far ahead as the leash will allow. I hate to have her always on a heel when we're walking for an hour but she just doesn't quite realize that pulling me in any direction she wants is not acceptable. I think she pulls ahead because the farther ahead she is, the more time she'll have to sniff, pickup, etc. any interesting object we come across. Every day she needs reminders but around a year old she definitely improved. Generally use a flat leather collar. Used a gentle leader for much of our walking from about 6-12 months of age. We use a 6 foot leash for most walking. Also have a 16 foot leash we let her drag in the open field behind our house. Pretty much other dogs are her biggest distraction. She thinks every dog is her best friend and every dog just wants to play and chase as much as she does. Also people that she knows well will cause her way too much excitement. Parks or well travelled routes where there are just tons of smells to get her attention. She probably walks the best when we are in crowds, i think becuase she's a little overwhelmed. We started seeing improvements around 7 or 8 months. It took about 3 months of hard work to get to this point. Sometimes it would take us an hour just to go around the block, which now only takes ten minutes....She still needs reminders at times, but not like it used to be. We started this training using a Premiers No-Pull Harness. This is a great tool. Everytime she would pull, it would cause her shoulders to be pulled together which would slow her down and cause her to swing back towards us. Now, we only use a a flat collar. I like the double handled leash for walks. Its a regular 6 ft leash and has an additional handle about 2ft from the collar connector. We use this alot and is great for walking in crowded areas. The length keeps them pretty close to a heel position. Everything was hard to overcome at first, but I found if you see the distraction first, you can get the attention first before you come up to it. This made it alot easier. If you do not see the distraction, then its very difficult to overcome. Its usually when we go to a new area we have not been in, that we have some issues at first. But now we can work through it with OB commands which can pretty much resolve them in the first 5 minutes. I try to expose her to every possible scenario I can. If we come upon a distraction that is new, we will work on that right there and now, until its not a distraction. By recognizing the distraction first is key, if not, then getting her attention back to you is my next step....I've learned alot about myself, by all this frustration and work that needs to be done. But its all worth it. when we were training Cody, we fount the choke chain to be pretty worthless. My daughter would always put the gentle leader on him. I would use the prong collar. after a while I did the stop/start method mentioned above. as soon as he started to pull we stopped. sometimes it was every step, but before the walk was over he got it. Cody started to improve about 2 years old. and needed constant reminders, particularly if he hadn't been out for a couple days. Apollo, appears to never have been on a leash by his behaviour. Odd, considering he has impeccable house maners. So I will likely be taking 3 hour walks around the block soon with him. Apollo came with a nylon collar with the same configureation as a prong collar, and that works ok. What is a flexi and a sensation harness? Great thread Kratty. I have definitely learned a bunch from it. At first I used the 180 method which is when your dog gets ahead of you you turn the opposite way but Chico decided he was still going to continue his way. I tried alot of different techniques I can't remember but eventually I turned to pulling his collar. I started seeing improvements with Chico's heeling at about 12 to 15 weeks old, then at about 6 months he went through a "I don't remember anythign" phase. So I had to go back and re teach everything. I used a prong for training. When we are at the park he's on his buckle collar and 20ft lead. I tried a halti on him but he went crazy, so I stuck to the prong. Now he walks calmly on a buckle collar, but sometimes I have to put the prong on to correct him. The hardest distractions WERE other dogs. I had to work hard to make him ignore other dogs. Nope. My dog knows heel and thats all that matters. Nothing around him should matter (he should still be alert) and it never does. We do the standard put the dog on your left side and hold a treat in front of their nose. If they pull you say Back and guide them back, eventually you will be able to stand up straight and they will just watch you with their head and nose right by your left thigh. We also sometimes walk the other direction that she is going...that way she learns to follow us. random turns on a longer leash they begin to catch on that they have to go where you go. Duchess is almost 2 and she still needs reminders...if we bust out the treats she is perfect! but when we don't have treats and a regular collar she needs to be reminded quite often. she knows when she is "working" and when she is just walking so for training we use a regular collar and 6 about a 2 ft. braided leash. she does perfect when she knows she is working...but On walks we put her prong on with a 2ft braided leash. She tends to naturally walk faster than we do on walks now that she is older...but as a puppy her nose was GLUED to the floor smelling everything! she walks better in large crowds...I would actually say she does worse when there are no distractions...she is great with other dogs on the leash since we have always taken her to the pet store as a puppy and to training facilities to train. I used the Koehler method for teaching heel, teaching the dog to pay attention, and not to pull. That is, when they lunge ahead, I abruptly about-turn and walk the other way, and when I hit the end of the leash they get a quick spin-around. The thing is, theres no jerking and yanking and the dog is actually correcting themselves, since if they were watching you and saw you turn, they wouldn't have gotten the correction. It works like a charm! I trained them with a simple chocke chain, no halti, no prong. But in public, unless I have more than one with me, they just use their regualr flat buckle collars and listen just fine. Everything that moves is a distraction, but they are all trained to listen and pay attention to me, ya know cause I'm so unpredictable with all those sudden about turns, lol. 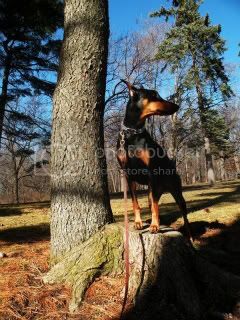 [QUOTE=Lexus;11451]How did you teach your Doberman to not pull on a leash? Any particular methods did you use? [I'm using the "Choose to Heel method, modifying it with the clicker. I also use a lot of stuff from Morgan Spector. (Clicker Training for Obedience) The clicker method is so reliable and it is really the only way to go if you're going to go on to agility or advanced obedience. I started our heeling over recently when I realized my dog didn't have a good concept where heel position actually was but she's coming along great. It actually takes about a year to teach a dog to heel but once they have it down it's a beautiful sight to see. In the meantime, her loose leash walking gets better every day. I click when she's by my side. If she gets ahead I stop, ask her to "back" and she backs up into heel position. I then click and treat her and we start forward again. In a distracting place or at the beginning of the walk we may have to do this every few steps but after she warms up we walk 30-40 steps without having to readjust. Eventually she should be locked into the spot. It's a bit complicated by the fact that she has to learn both sides because of agility. I call the left "close" and the right "side". She's still a little confused about the right because we've only been doing that for a month or so but she's getting it pretty well. At what age did you start to see any improvements? How often do they need reminders? [She's currently 20 months of age and going through an adolescent stage but I see improvement every week despite her adolescent changes. In fact, every session I see some improvement. We try to work every day which means we probably work 4-5 days a week plus obedience class and agility class. [B]What type of collar and leash do you use? I use a buckle collar at all times except for classes where I use a leather choke collar that fits right behind the ears snugly. 6 foot leash. If we go hiking I use a flexi-lead and let her walk as far in front as she wants which is usually the end of the flexi-lead but don't allow any tightness on the leash. [B]What distractions are the hardest to overcome?The other dogs in her group obedience class probably since I trained her alone until last month and the BUNNIES in the front yard/neighborhood. [B]Are there any particular situations that you find more difficult to walk in than others? I've waited on trying to get her CGC because I'm not sure she can walk face to face with another dog and keep a loose leash. At 8 weeks, we started loose leash walking. I would stop cold every time Vegas pulled the leash tight, and start instantly when she gave me slack and made eye contact. I found that it worked better if I waited until she came back to the heel position against my leg, because it was much less abstract, I could mark the exact second she touched my leg by walking again. She picked that up in one afternoon. Then I clicked and treated for every step she stayed in the heel position, then every two steps, then five, etc. until we also had a perfect heel. I also clicked and treated when she made eye contact for a full second, then two, etc. She now will usually heel even when not asked, and I will slip her treats for it occasionally. Walking up to the dog park! We have to make several passes each time, and we go every day! Hi, I am new but I have used the halti on my greyhound for years, she is immpossible without it. It works like a horse halter. when you pull they have to turn there head. You may get a little argumant about it at first but I love it. They have to stay right next to you and can't turn unless you lelt them. I have trained dogs for years and this is the easy way to teach heal. Just got Max 2 wks ago. When he arrived, he was dragging the lady who brought him to my house, gasping for air, only his hind legs on the ground. He's 17 mos old. Since I hadn't planned to get another dober-dog, I didn't have anything large enough to fit him, so I used my mini Dachshund's leash & made a slip out of the handle end of it. In an 1/8th of mile, he was already paying attention. Each walk starts with multiple turns, stops & sits. After 2-3 mins of that, we walk for about an hour or so and only have to correct when there's a distraction. Within 3 days he was already looking at me when a small distraction presented. By week 2, we only have multiple corrections when another dog is in sight. Mostly a chain slip. I have had dogs that needed a prong collar as a backup at times, but not for long. Other dogs, but we're just starting. People who want to call, cluck, chortle and otherwise create excitement when he's supposed to be working!! Kohaku used to do that too at a particular spot on our walks. Try finding another way around or a wide pass. You can also do some training to distract the dog and get it through the area. Bribes also might work, but best to walk slowly with him. I used to do these things, also used to; hold him around his chest and walk him on his back legs, holding him under the chin next to his neck and another hand over his back on his shoulder(touching seemed to reassure him I was still there), if need be just walk quickly or even run and just keep going(distracted him). Did anything happen in that area? Could you two just sit around that area and let him slowly explore, toss treats around and let him go on his own(long leash) to get them? I started walking her as soon as I got her and I dont really recall her pulling on it hard. I went to training class and my trainer does not like the halti or choke but recommends the prong. For one week we were to give her the full length of the leash and right before she was going to run out of leash and pull you give a quick pop (gently not to hard) this is 4 blocks for one week, then one week 4 blocks with half length leash, and then shorten it to where she is on your side. Then we used pilons to weave in and out of and give the command heel with the use of treats which we phased out. My girls biggest distraction is other dogs she wants to play so bad. She does great in large crowds b/c there is so much going on she cant focus on one thing. My Dobbie pulls like hell when we start of for our walk, like the two before her she won't take any notice about walking to heal. Have tried all sorts of collars, (except the prongs which I think are disgusting and should be banned throughout the world, they are not even on sale in the UK) and none work. However, once we have got to the Beach which is about four minutes from my home and she has had a run, she walks perfect on a flexi lead. Would love someone to tell me how I can stop her pulling at first but don't think it's possible. I used to think this about prongs too. But have you ever tried a prong on yourself? The other day, while visiting the pet store, I put it on my arm and asked my boyfriend to give it a good tug. There was pressure, but it didn't *hurt*. No sharp pain like I've felt with the choke chain collars...it literally pinched me! Just pressure. I can't imagine choking yourself with a nylon, leather, or chain collar feels any better! Not trying to change your mind, I just think that people (myself included!) are quick to judge things they don't fully understand. I'd hate to be called cruel for using a valuable training tool on my dog! I got Ziva at eight weeks old and immediately started leash training. She was such a joy on a leash--for about a month. Then she discovered the fun of "pulling". She is now 4 months old, and I have just recently started using a Gentle Leader head halter with her during training classes, and on short walks. I make absolutely certain that she only has enough leash to stay beside me, not lag behind or run in front of me when she is wearing the gentle leader device. It helps. Her pulling stays at a minimum level, but still doesn't totally disappear altogether. I am hoping that we can eventually stop using this training tool and just go with a flat buckle collar, but while she is still this young, I dont see that happening. "Train now, or forever hold your leash"